A survival store's solar panels would keep the consumer green. Stores stink. Yes, they're not selling anything. Open up the business pages any day of the week and you'll see news of shops liquidating, workers getting laid off, retailers bleeding cash. But you can't blame just the economy for consumerism's woes. Think about it: When was the last time you walked into a store and saw, or just felt, something fresh? Most retailers have attacked the recession by discounting their products to pennies on the dollar. But the whole system is in disarray, and 70% off isn't the sole solution. What we need is a bigger fix. It's not about just dropping prices to match consumers' diminished buying power. Shoppers aren't going to buy the same things they used to, and they're not going to buy them in the same way they used to either. What we need is a whole new kind of store. What should the shop of the future look like? Simon Graj, CEO of Graj + -Gustavsen and a respected retail consultant, is pushing a concept he smartly brands the "survival store." Graj envisions a place where you can get the goods you need  low-cost food, clothing built to last a few winters, a bike to substitute for the new car you can't afford  while offering experiences that help you cope during these difficult times. Why couldn't you float from the food department to the living-and-leisure department, where you could meditate with a local Yogi? Or to the education department, where experts could offer sensible financial advice? "Helping people go fearlessly into the future  and have fun doing it  is the idea," Graj says. Some retailers are already catching on. French-based retailer Carrefour, for example, has built "hypermarkets" where consumers can buy food and have their computers fixed. These days, a survival-store brand could be cool. It's suddenly hip to save money. Dollar stores are thriving  there's no shame in trading down. Retailers should be straight with their customers, who are in no mood to decipher some muddled marketing pitch. This is a survival store, plain and simple. Come in and look around: all these other people are in the same boat. Have at it. That simple message might just inspire a very sad shopper. 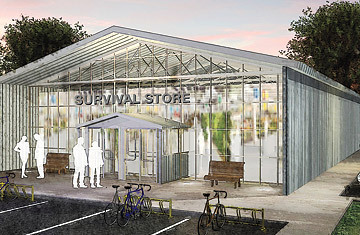 Once the economy rebounds, the survival store will be a relic, right? But hold on. We've lost too much wealth to return to the old days. Even if the economy roars back, could we really be dumb enough to revert to our old habits of conspicuous consumption? From here on out, the market for sensibility will be stable. Survival will always be in season.